Offer a process deemed neutral for all parties. Offer the best independent scientific and technical expertise available to review and decide on conflicting flood hazard data for flood maps. Provide efficient resolution to community challenges of proposed flood hazard data. 1.1b An SRP is not intended to be the first step toward resolution. 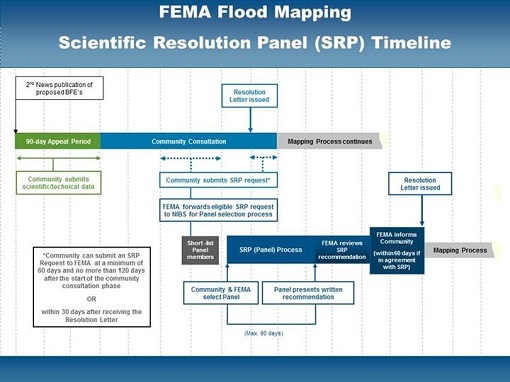 Historically, FEMA has used community consultation to resolve appeals to proposed flood hazard data. FEMA continues to be committed to the concept of community consultation to resolve conflicting data in an interactive, collaborative process which typically leads to satisfactory resolution. On occasions when community consultation cannot produce a mutually acceptable resolution, the SRP shall be made available. The SRP process has been established for the purpose of performing independent reviews of scientific and technical data submitted by a community challenging FEMA's flood elevation data and FIRMs. Based on the scientific and technical data submitted by the community and FEMA, the Panel will render a written decision as to which data and analyses represent the best available science. The Panel's decision shall serve as the recommendation to the FEMA Administrator for his final determination of the flood hazard data. Have the community CEO or authorized representative complete and submit to FEMA during the stipulated timeframe an SRP Request Form (Appendix B) which includes the community's specific contentions of the incorrect scientific and technical information used by FEMA in developing the proposed flood hazard data among other information. IF requested by a community, a commitment from the community that they will sign a Community Submittal Agreement (Appendix C). A Community Submittal Agreement is a release of all liability of the Panelists for their participation on the SRP and the Institute for administering the SRP process. The Parties agree to these rules and procedures, and any amendments in effect, at the time the administrative requirements for a request for an SRP have been met and an independent Scientific Resolution Panel has been convened to hear and decide on a community's challenge of FEMA's proposed flood hazard data. 2.2a The Institute, pursuant to a contract with FEMA, as Panel Sponsor shall establish and maintain a cadre of scientific experts (hereinafter referred to as "SRP cadre members" or "Panelists") from which shall be convened an independent scientific body (referred to as an "SRP" or "Panel"); to make the SRP available to FEMA and communities pursuant to the Act; and to administer SRP operations. The purpose of these rules is to set forth the understanding, terms and conditions by which Panelist shall serve on the SRP cadre of experts and, if selected, serve on an individual Panel, and by which FEMA and the community submit their conflicting data to an SRP for resolution. 2.2b The Institute may terminate a Panel at any time for convenience or cause. Amendments to these rules shall require approval of FEMA and the Institute President. Amendments to these rules approved by FEMA and the Institute President shall become effective on a date to be determined by staff but no later than a request to convene a new SRP. 2.4a The Panel, once appointed, shall convene to review the conflicting data submitted by FEMA and the community, hear oral presentations from FEMA and the community if deemed necessary and establish a majority decision on the appropriate data. The Panel shall then render a written recommendation, with supporting rationale, as to whether FEMA's proposed flood hazard data are scientifically or technically incorrect, as provided for in the National Flood Act, as amended by (42 USC 4104(e)) (the Act), the Federal Emergency Management regulations (44 CFR Part 67) (the regulations) and in accordance with these rules. The Panel's decision shall constitute a recommendation to the FEMA Administrator, who shall render a final determination. First, review FEMA data for sound engineering practice and principles, limited to the contested data. it is superior to FEMA data. Establish its decision based on these reviews and recommend either the acceptance or denial of the community submitted data for inclusion in a revised flood map in part or in whole. FEMA's data does not satisfy NFIP mapping standards defined in FEMA's Guidelines and Specifications for Flood Hazard Mapping Partners (NFIP standards) and must be revisited. Community's data satisfies NFIP standards and wholly corrects or negates FEMA's data. Portions of the Community's data satisfy NFIP standards and correct or negate FEMA's data. Community's data does not satisfy NFIP standards, thus FEMA's data is not corrected, contradicted, or negated. Community's data satisfies NFIP standards and is correct, but does not negate FEMA's data. 2.5a When FEMA determines to make the SRP process available for a specific challenge, and the community agrees, FEMA shall notify the Institute to convene a Panel by submitting an SRP Request Form, executed by the community, containing the name of the community, nature of the challenge, the scientific and technical data needed to develop a list of potential Panelists, the names and address of the community CEO or authorized representative, appropriate sections of the Technical and Scientific Data Notebook (TSDN) related to the conflicting flood hazard data and a summary of the issue. 2.5b FEMA may choose to exercise the SRP process without community endorsement for other scientific needs as deemed appropriate by the FEMA Administrator or Federal Insurance and Mitigation Administrator in consultation with the Office of Chief Counsel. 2.5c The Institute shall confirm receipt of an SRP request to FEMA and the community within 2 business days of receipt of an SRP Request Form. The Institute may initiate an administrative review of the SRP Request, by telephone, with FEMA and the community to address such issues as Panel member selection, review the nature of the challenge and the technical and scientific data submitted, expertise needed on the Panel or any other administrative matters. 2.7a Membership to the SRP cadre is open to individuals with proven scientific and technical knowledge and expertise in the field of surface water hydrology, hydraulics, coastal engineering, or other engineering and scientific fields relating to the creation of Flood Hazard Maps and Flood Insurance Studies. Persons meeting and exceeding the SRP qualification criteria and interested in serving on a Scientific Resolution Panel shall complete an online application form; provide all required supporting documentation requested on the form, and complete an affidavit certifying knowledge and understanding of the Act, the Regulations, the SRP Rules and Procedures and any other required reading. 2.7b Confirmation or rejection of membership shall be issued by the Institute to the applicant within 15 days of receipt of the fully completed online application form. 2.7c Panel members shall agree to update their professional information as necessary for the duration of their membership on the SRP cadre. 2.8a Panel members shall agree to serve on at least one Panel per year, if so requested, averaging two to five 8-hour-days effort over the course of several months. 2.8b Panel members may withdraw from the SRP cadre at any time with 10 days written notice to the Institute prior to the effective date of the withdrawal. Panel members shall not withdraw from the SRP during service on a Panel except for good cause given in writing to the Institute. 2.9a Within 15 days after receipt of an SRP Request Form, the Institute shall send to FEMA and the community a short list of 10 pre-qualified potential Panelists chosen from the SRP cadre of experts. Selection of potential Panelists shall be based on the technical challenge of the appeal and the expertise required to review FEMA's and the community's conflicting data. Potential short-listed panel members shall have no personal or professional interest in the appeal and shall not reside in the community's state. The Institute shall confirm that all pre-qualified short listed Panelists are available to serve. 2.9b FEMA and the community shall have 15 days from the transmittal date of the list of potential Panelists to indicate names objected to and return the list to the Institute. If a party does not return the list within the time specified, all potential Panelists on the list shall be deemed acceptable. 2.9c FEMA and the community shall select a Panel of typically 3 or 5 Panelists, based on the availability of Panelists and or scope of appeal, from the submitted short list of potential Panelists. Within 30 days from the transmittal date of the list of potential Panelists, the community shall designate a simple majority of the Panelists; FEMA shall designate the balance of the Panelists. 2.9d If FEMA and or the community fail to designate any or some of the Panel members within 30 days from the transmittal date of the list of potential Panelists, the Institute shall select all or the remaining members to form or complete the Panel. 2.9e If for any reason, appointments cannot be made from the FEMA or community designated selection, a new list shall be sent to FEMA and community and new selection process shall commence. If, for any reason, a Panelist is unable to perform the duties of a Panel, the Institute shall declare the applicable party selection vacant. The Institute shall provide a short-list of five potential Panelists from which FEMA or the community shall choose a new member in accordance with these applicable rules. From the lists of FEMA and community selected Panelists the Institute shall invite a member to Chair the Panel. If members do not respond to the Institute invitation, the Institute shall make the appointment. 2.12a Each Panel shall consist of typically 3 or 5 Panelists based on the availability of Panelists and or scope of the appeal. The community shall select a simple majority and FEMA shall select the remaining members. 2.12b Pre-qualified Panelists shall be representatives from Federal agencies, academia and private industry. FEMA and DHS Employees shall not be able to serve on a Panel. Pre-qualified Panelists may not reside in the State from which the challenge has been filed. 2.12c Panelist shall be considered an independent contractor to the Institute. The Institute shall not direct, control or monitor Panelist's work on any Panel. 2.12d Panel members may not serve on more than one Panel at a time. 2.13a SRP cadre experts shall disclose on their application form any circumstances likely to give rise to doubt as to their impartiality or independence, including any bias or any financial or personal interest in the result of an SRP decision. 2.13b Upon notification that one has been short-listed to serve on a Panel, Panelist shall disclose to the Institute any actual conflict of interest with the parties to the appeal, or any circumstances that might be perceived as constituting a conflict of interest or a bias in favor of or against either party. Short-listed and appointed Panelists must disclose any facts or circumstances that might be seen as affecting their ability to decide the appeal fairly and impartially. In the event of such a disclosure, the Institute shall determine whether a different Panelist should be selected to serve on the case. The Institute may remove Panelist from a Panel, at its sole discretion, for convenience or cause, including for apparent or actual conflict of interest, demonstrated bias or partiality, misconduct related to service on the Panel, or misrepresentation on Panelist's application profile. FEMA and the Community shall not contact any SRP cadre members, potential short-listed Panelist, or Panel members about any aspect of an appeal, before, during or after a final decision has been made. 2.16a Panelist shall not disclose the internal deliberations of the Panel to FEMA, the community or to the public. 2.16b Panelist shall not to disclose the final decision of the Panel unless and until that decision has been made public by the Institute or the FEMA Administrator. draft and approve final report for FEMA Administrator. 3.2 Panel Members Only Portal. 3.2a Once selected to serve, Panel members shall be given access to the SRP Portal Panel page they have been appointed to. Panel members shall only be allowed to access their Panel page environment. A contact section with the name and contact information of the Panel members appointed to that Panel. A Panel specific email tool for ease of communication with Institute staff the SRP Chair and all the members of the Panel. A files section to post all data, packages, analyses and perform independent reviews and exchange of information between Panel members. A tasks section to assign and schedule specific actions to the members of a Panel. An actions section to keep track of all assignments and expected deliverables. A comment section to discuss specific documents with an automatic email notification feature to alert members of new postings to each discussion thread. A calendar to track and post Panel meetings, agendas and scheduled oral presentations. 3.3b Periodic meetings shall be scheduled with the Panel to keep track of Panelists' progresses. Second, review the community data on a point-by-point basis to determine which elements satisfy NFIP mapping standards and negate the FEMA data. 3.5a Oral presentations are optional and may take place if requested by the community, FEMA or the Panel. The community shall include a justification for an oral presentation in the SRP Request Form. The Panel may request oral presentations on submitted data made by the community and FEMA when deemed necessary. 3.5b If requested and after consultation with the Chair of the Panel, Panel members, FEMA and the community, staff shall set the date and time of the oral presentations. All parties shall respond to scheduling requests for oral presentation dates and time in a timely manner. 3.5c The Institute shall send a Notice of Oral Presentations to the parties at least 10 days in advance of the presentation date. Any persons having a direct interest in the submission can attend the oral presentation via web conference. The Chair may postpone any oral presentations, upon agreement of all parties, at the request of a party for good cause. Any oral presentation may proceed in the absence of any party who after due notice fails to present or fails to attain a postponement. If an oral presentation is called, the community and /or FEMA may elect to waive oral presentations by submitting a Waiver of Oral Presentation Form to the Institute staff when contacted to schedule a presentation time and date, or at any time but at least five days prior to a scheduled presentation date. The community and FEMA oral presentations and Panel meetings shall be recorded. The transcript from stenographic or audio recordings shall be the official record of all presentation and meeting proceedings. All transcripts shall be available during Panel deliberations. 3.10a At the discretion of the Panel Chair, and after consultation with the members of the Panel and the Institute, FEMA and the community may have the opportunity to present via web conferencing their scientific or technical data they submitted to the Panel. No new data shall be submitted by either FEMA or the community to the Panel during oral presentations. The data the community presents can only be the data submitted during the appeal period. 3.10b FEMA and the community shall be offered equal time to submit their report and data. The Panel Chair shall determine the allowable time for each oral presentation and for the Panel Q&A or if more time is needed. FEMA and the community may be asked to submit an outline of their presentation 5 days prior to the presentation date of the oral presentations for distribution to all parties. 3.12a The Institute and Panel members may modify any period of time by mutual agreement. The Institute may for good cause extend any period of time established by these rules, except the time for delivering the Panel's final written report and decision to FEMA. The Institute shall notify the community and FEMA of any extension. 3.12b The Chair may request for an extension of time, upon agreement of all Panel members, for good cause, by submitting a Time Extension Request Form to the Institute staff. 3.13a Panel members shall keep their deliberations tightly focused on scientific and technical issues and the correctness of FEMA data. After reviewing the contested FEMA data for sound engineering practices and principles and compliance with NFIP standards, the Panel will review the community data on a point by point basis to determine which elements satisfy NFIP mapping standards and negate the FEMA data. The Panel will render a written decision to "accept" or "deny" in part or in whole, the alternative flood hazard data submitted by the community based on the scientific and technical information submitted by the community and FEMA. The Panel's decision shall serve as the recommendation to the FEMA Administrator for his final determination of the flood hazard data. FEMA's data does not satisfy NFIP mapping standards and must be revisited. The community's data satisfies NFIP standards and wholly corrects or negates FEMA's data. The community's data does satisfy NFIP standards and is correct, but does not negate FEMA's data. 3.13c Final deliberations and vote of the Panel members shall take place during a conference call. A simple majority vote of the Panel shall decide to either recommend FEMA accept or deny the community's alternate flood hazard data in part or in whole. The Panel rationale for its findings. The Institute shall deliver the Panel's written report and decision with rationale to FEMA and the community no later than 90 after being convened. 3.16a The Panel's report will be made public. The report will be posted on the SRP public website within 15 days of delivery to FEMA and the community. 3.16b The Panel's report and the Administrator's final determination will be added to the community's Flood Elevation Determination Docket (FEDD). The FEDD shall contain the information as stated in CFR 44 Part 67.3 to show that FEMA has provided due process to communities impacted by new or updated flood hazard information. Upon delivery of the Panel's report to FEMA's Administrator and FEMA's acknowledgment that the Panel's report is complete, the Institute shall declare the Panel closed. The community's flood elevation data package shall be accepted or denied in part or in whole by a simple majority of the SRP members. The quorum for any meeting of an SRP during which any decision or vote is taken shall be a full majority of all members on the Panel. Any requirement for notice as specified by these rules shall be deemed satisfactory if made by e-mail to all parties to whom notice is due, or by some other electronic means that is available to all persons to whom notice is due, and the recipient's acknowledgement thereof. Any requirement for making documents or information available as specified within these rules shall be deemed satisfactory if such documents are posted to a web site or portal accessible to all persons entitled to such access and accompanied by proper notice of the postings to all such persons, or by some other electronic means that is available to all persons entitled to such access. Panels shall keep accurate records and make available to FEMA and the community all written matter generated by the Panel and will work with the Institute staff as appropriate in the fulfillment or their responsibilities. The Chair who shall be appointed by the Panel members or as provided by these rules shall be responsible for fulfilling this obligation. The records to be maintained shall include, but not necessarily be limited to: agendas and minutes, correspondence, including meeting notices, reports, resolutions and memoranda summarizing significant verbal communications, including instructions from the Institute. Panel members shall be compensated $1,500/day for each 8 hour day served on a Panel, prorated for actual time worked. If travel is involved, Panel members will be reimbursed actual airfare and daily government per diem based on actual receipts provided to the Institute. Chairs shall be compensated for their extra services on the Panel.